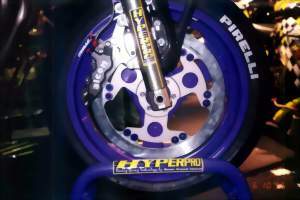 In 1993, The founder of Hyperpro, Hans Rinner developed the ambitious idea to improve motorbike suspension by thinking ‘progressively’. He spent a year developing his new plans and after that year Hyperpro was established. He started by selling a modest selection of suspension products. However, convincing bike riders of the progressive spring principle proved to be harder than expected. At that time, there was a Kawasaki Z1000 that had a problem: due to the high brake horsepower the frames of the Z1000 were prone to cracking. Hans Rinner therefore decided to replace the standard springs of a Kawasaki Z1000 with progressive springs. The Hyperpro progressive springs completely solved this problem. 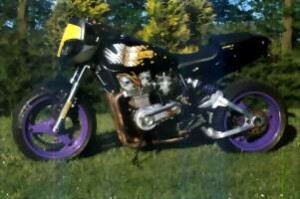 A journalist was so impressed by the adjustments that he called the adapted Z1000 bike ‘the best ride ever’. This article was published worldwide in several motoring magazines; this is how it all started. After a few months, the interest in Hyperpro products appeared from an unexpected corner: Japan. This is how a Japanese company called ‘Active’ became the first distributor of Hyperpro. Several months later, many progressive springs were shipped to Japan. Other countries and distributors followed and a worldwide network of Hyperpro products was born. In the first five years, Hyperpro concentrated itself 100% on manufacturing and selling progressive springs. At that time, Hyperpro already had more than 600 types of springs in our range. Despite the success, new progressive products were bound to follow. In addition to the progressive springs, the concept to develop a new steering damper emerged in 1998: the speed sensitive steering damper. The idea behind this damper is that slow movements of the handlebar should not be felt, and as soon as the handlebar starts shaking it should keep the motorcycle in line to avoid tank slappers. The steering damper went to market and Hyperpro started to manufacture mounting kits for steering dampers itself. Initially, these kits were made of steel, but following new techniques, the completely CNC-milled mounting kits were born. Developed and manufactured in our own production facility. 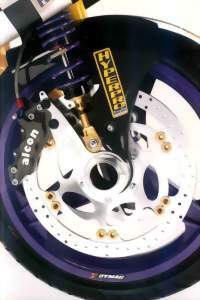 Only a few years later, the first Hyperpro shock was developed and launched onto the market. This shock was subject to further development for the next seven years. The knowledge and experience that were gained, helped Hyperpro to design a totally new shock in 2006: the 3D shock, at that time the new showpiece. The greatest asset that Hyperpro has, is that everything is in our own hands: from development to production, from testing to sales. Briefly mentioned: we are unique in motorcycle world. 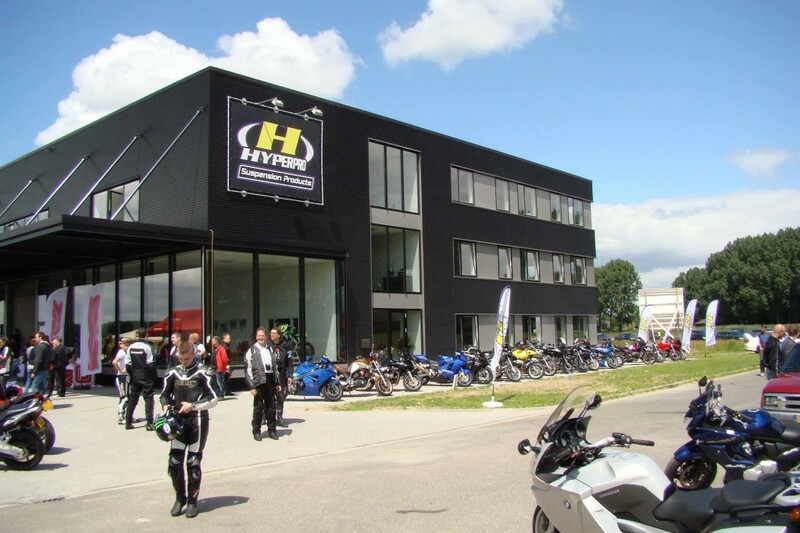 In 2007, Hyperpro started to establish its own workshops to help riders and dealers in advising and installing suspension products. Since 2008, Hyperpro also focused on the adjustment of the height of motorcycles to an acceptable height for the rider. By using progressive designed springs to adjust the height of the motorcycle, Hyperpro reached a totally different and new market. Now in 2016, the company is still growing, we currently have 25 employees, an over 1000 sqm sized building, and is exporting to more than 40 countries around the world. 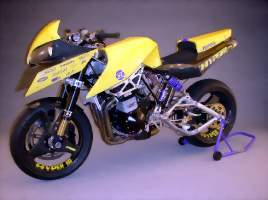 The Hyper 1 was invented by our own Hans Rinner and Hans Oosterhoff (TROLL Engineering) in 1992. The bike was exposed on most major bike-exhibitions and has been tested by most of the worlds’ leading motorbike magazines. Is it possible to adapt a three generations old bike, so it will run like a new, modern bike? With this question in mind Hyperpro began the transformation of a twenty-five year old Kawasaki Z1 in 1998. 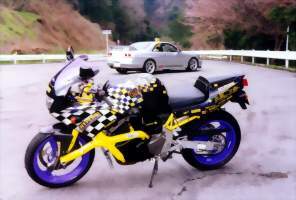 In the year 2000, the latest Hyperbike rolled into the workshop, it was a standard Suzuki GSX-R1100R. First of all, the cylinder capacity was enlarged to 1340cc and with a lot of additional adjustments to the engine, the capacity was increased to 200 BHP in the end.